Last year I highlighted the Top Restaurant Apps for Dairy-Free, Vegan, and Food Allergies, and it was very well-received. 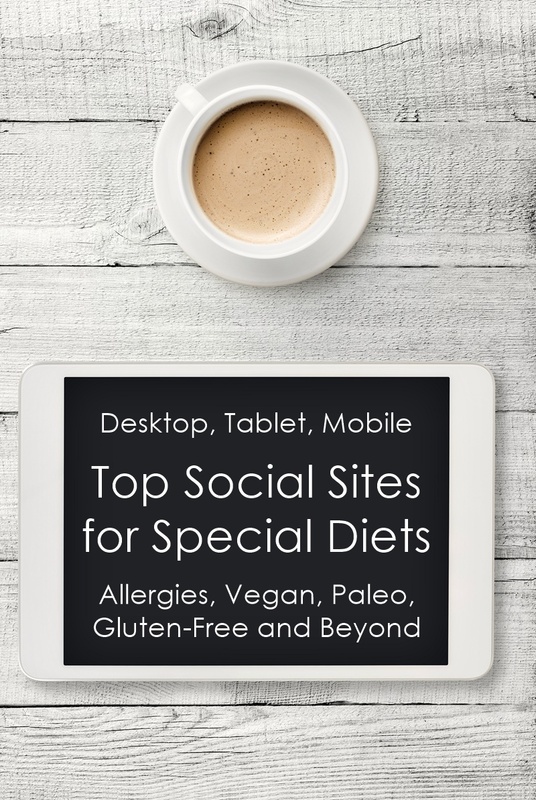 So I thought I would revisit the technology arena and share some amazing social sites for those of us who follow a special diet … whether it be just dairy-free, gluten-free, vegan, multiple food allergic, paleo or beyond. All of the following websites can be used on your Desktop, Tablet or Mobile Device. They’re priceless for your holiday planning, but also for making everyday eats and events a delicious and safe adventure. Whether you’re looking to share recipes, tips, news and inspiration, or hoping to find some, Freedible could be the new social network for you. Much like Facebook, conversation and sharing is encouraged, but unlike that behemoth, it is organized into sections of interest and it’s all about those of us who have special diet preferences or needs. This may be vegan, gluten-free, food allergic, paleo, or simply a picky eater! Freedible is a small but growing site, with more passion behind it than I’ve ever seen. As you can see from the collage below, it’s a multi-faceted site with good people, great food, and a community that cares. 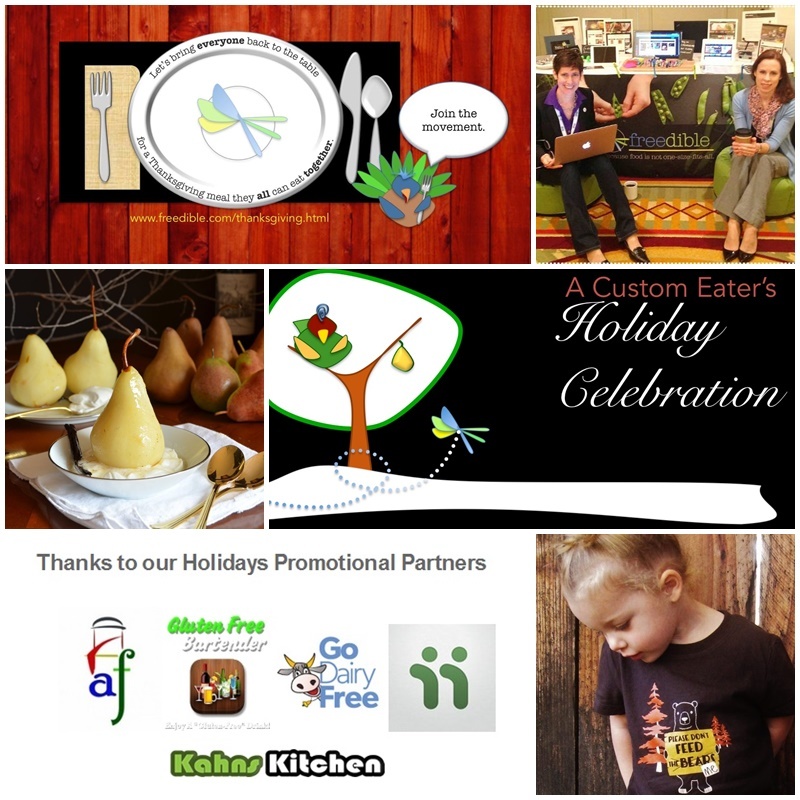 They also hold all types of events – from cookie exchanges to giveaways and twitter parties! It’s a gathering of so many people who feel strongly about their health and diet, giving you the chance to meet others who eat just like you! And of course, there is a Dairy-Free Group to join, and yes, I’m in it! This is such a novel concept! On My Friendly Reminders, you create a profile that lists all your food preferences and dietary restrictions and then share it with your friends who can also easily sign up and create their own profiles. It is really simple and straightforward, but covers all the bases making sure that you a) Avoid that awkward moment when you have to tell someone you can’t eat the food they have prepared, b) never again have to ask: “What foods don’t you eat?” c) can share your children’s dietary restrictions with caregivers, and d) can easily plan your own gatherings around dietary restrictions. My Friendly Reminders allows you to create events, from birthday parties to soccer games, holiday gatherings to potlucks, and gives you reports with quick overviews of all the dietary restrictions and culinary preferences found among groups of your friends, family, and coworkers. Think about it, it can help in menu planning, make sure all guests are included AND help prevent people from getting sick due to allergies or intolerances. Want to invite me to a party? I’m on there! Have you Yummed? 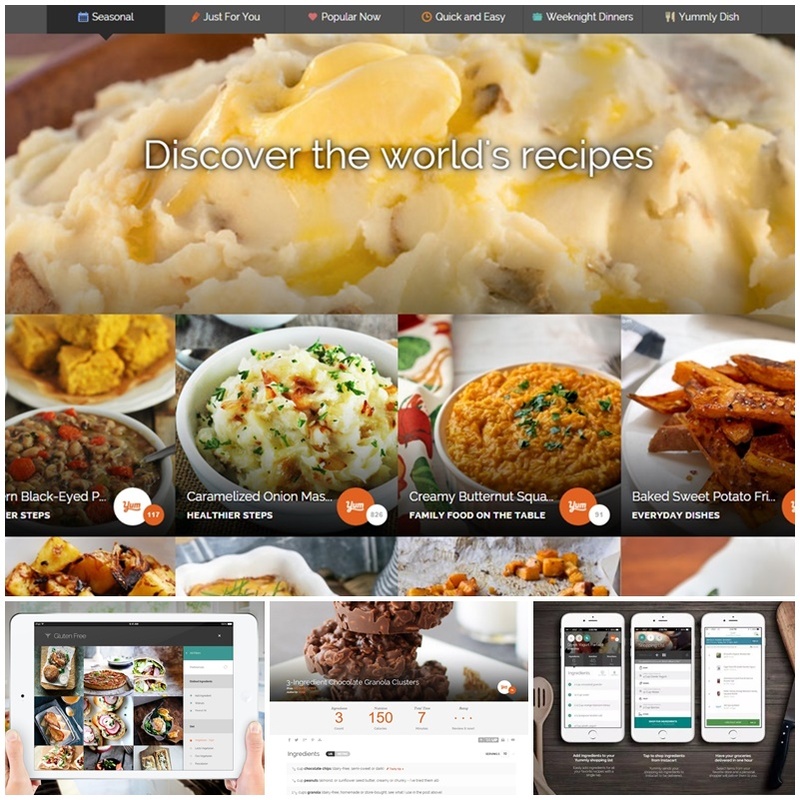 Think Pinterest meets your more organized and detailed recipe files and you’ve got Yummly. It’s a fantastic way to log your favorite recipes, the ones you must make, and those that are simply for inspiration, and it’s SO fast to use the Yum button. Though Yummly isn’t exclusively for special diets, it’s still very helpful for free-from eaters. The recipes you like can all be sorted into personalized Collections (think just dairy-free, DF/GF, cookies, dinners, etc) for you to quickly access and figure out what to make for dinner! You can also check your favorite allergy-friendly publishers and scan at a glance what they have to offer. 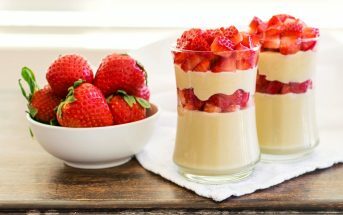 Yummly shows you a picture of the recipe with the title in a simple layout, and gives you a snapshot of the ingredients, calories, servings and more. Interested? 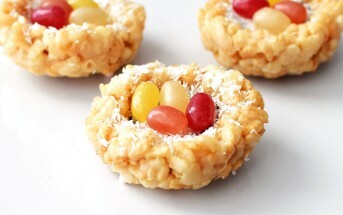 Just click through to the recipe for the directions! You can also socially share the recipes with others directly from Yummly. For a snapshot of publisher pages, see Go Dairy Free on Yummly. This awesome website is listed in our Top Restaurant Apps post, too, but it’s worth mentioning here since they have a full website that can be used on your desktop, tablet or mobile device AND it just received a full makeover. 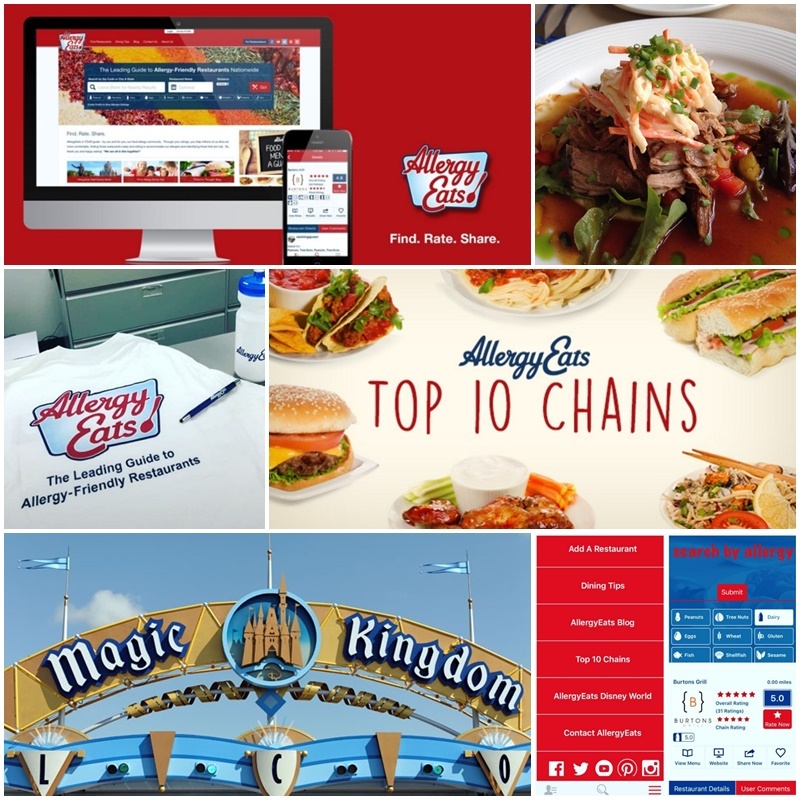 AllergyEats is a place where users with food allergies can post reviews of their experiences at restaurants across the country. Consequently, readers can enjoy personal restaurant reviews focused specifically on special diet needs. The new and improved AllergyEats is easier to use and faster, with improved reliability. 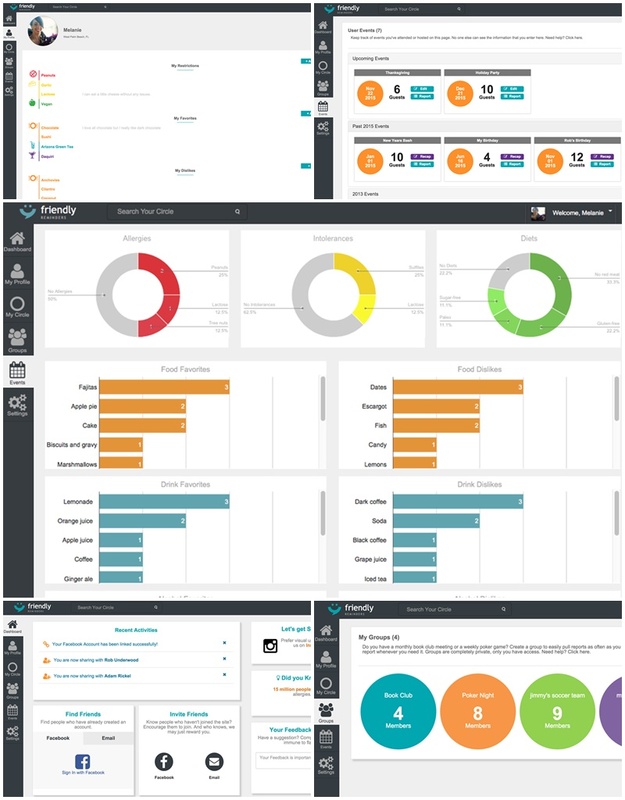 It’s also more customizable, allowing users to access results catered more closely to their individual dietary needs. And, it’s more social! AllergyEats now encourages greater engagement and connections with others in the food allergy community. Did I miss any of your favorite Social Sites for Special Diets? The Minimalist Baker is a great blog for getting dairy-free dishes! I am also an instagram recipe seeker. crazy, I seriously didn’t realize instagram was such a recipe hotspot. 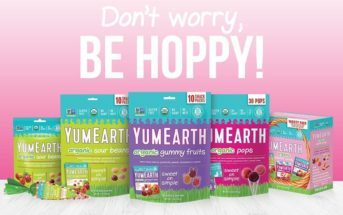 I use Yummly all the time, but am looking forward to trying the AllergyEats site. I use dairyfree.org, of course. Freedible is great. I also like the sites for Silk and Earth Balance. I also use about.com and Veg News magazine’s site. Aw, too sweet! thanks for sharing some other great sites, too. I use godairyfree and simply. Thanks! I haven’t used any of these sites, but I love using Instagram to discover recipes! That’s unique – I’d never thought to use Instagram for recipe inspiration. My Friendly Reminders is new to me but I use the other 3 regularly! Great resource, thanks Alisa! That’s awesome Sharon! I think you might like My Friendly Reminders, too. It’s pretty cool. I haven’t tried these sites, but still love facebook for my social site for new recipes & recipe swapping. I’ve gotten recipes from yummly. I have used Yummly and like it. I don’t use it very often though. I have chronic migraines and have been trying various diets to try to control them, and some of these diets can be rather obscure so I use Pinterest the most. That must be frustrating Krista. I would check out Freedible as there are actually quite a few people on there with migraine issues / diets. Also, my friend Stephanie at http://reciperenovator.com/ does recipes for the Migraine Diet. This might be helpful for you. This is Paul from AllergyEats. I appreciate the feedback. Please feel free to send us concerns or criticism anytime on our Contact Us form. We love criticism – it helps us improve the app and site for everyone. Regarding your specific concern, remember that we are a community site. Ratings aren’t coming from us, but rather from the community. We believe in the wisdom of the crowd. I don’t know the specific region of the country you searched, so I couldn’t replicate it, but the other issue is that there might not have been many ratings on that restaurant (or maybe none from a dairy-allergic individual). We have the allergen-specific ratings so you can check for such anomalies, such as if that restaurant was great for any allergen EXCEPT dairy, as an example. Thus, the more restaurant ratings AllergyEats gets from everyone, the better the resource it continues to become. It is obviously far better than 5 years ago – and 5 years from now it will be infinitely better. So we strongly encourage everyone in the community to rate their restaurant experiences – good, bad, or meh – every time. I would even ask you to, whether you like the app and site or not, in order to make it better for the future. The best I can advise you, if you have problems at Italian Cottage or just can’t eat there, is rate it on AllergyEats to share with the entire community. If you add yours, the app and site become just a little tiny bit better. Thanks so much for jumping in with your feedback Paul. I always love how attentive you are to reader needs and allergy issues! AllergyEats needs a lot of work! I’m lactose intolerant, which seems to be becoming more common nowadays. I’ll set the AllergyEats app to find dairy-free restaurants in my area. One of the restaurants it comes up with is Italian Cottage, which happens to be one of my pre-lactose intolerant favorites because many of their dishes are filled with lots of nice melted cheeses. As a matter-of-fact, with a restaurant that serves mainly pastas, pizzas and Italian sandwiches, good luck finding anything that does not have Parmesan, Mozzarella, or some other variety of Italian cheese in it, especially in the sauce or whey or non-fat milk in the bread although sourdough is usually safe. If I get a recommendation for a specific allergy-free restaurant, I would like it to have a few allergy-free choices rather than bread and water. Thanks so much for sharing this Adrian! Have you used it since they launched the new site / app last week? I’ll request that they take a look at your feedback as I’m sure it will be helpful! Thanks Adrian. I have nudged them to take a look at your feedback – I’m sure it will be useful!